Wheel balancing is an essential step when putting new tyres on your vehicle. Wheels that aren’t balanced cause vibrations that can produce premature wear in your tyres, suspension and steering, so you should always ensure your wheels are balanced when new tyres are fitted. The process involves using a computerized wheel balancing machine to calculate the exact weight and location for the counter-weights which are placed on each wheel. If you need new tyres and you like the idea of having them delivered, fitted and balanced, then simply contact us. 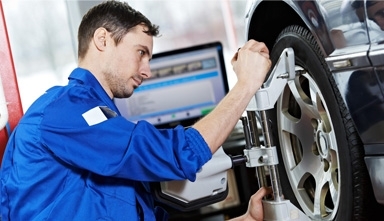 We will then provide our expert recommendations on what tyre is best for your vehicle and a full quote. We have all the leading brands, from Bridgestone, Michelin, LingLong and Casumina to Pirelli and all are available at highly competitive, all-inclusive prices. Aik Koon operated its business for more than 40 years, experience and pride together give you piece of mind knowing your vehicle is in safe hands. Dealing with predominantly owner / drivers, we pride ourselves on providing a more personalised approach to our customers. We believe in providing a tailored service to everyone we deal with, understanding that every business works differently. We provide emergency breakdown services nationwide. This service complements the service provided in our workshop by providing them the extra support and service they need.